The backlinks are incoming links to your blog. 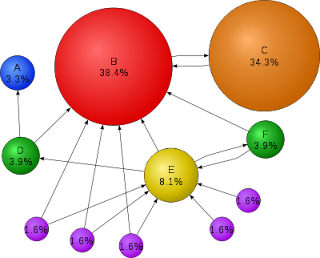 The google pagerank is the score of your blog. more important is the pagerank of each backlink. The anchor text is also important, the anchor text is a clickable text ,it`s need to be relevant to your page. As you see in the above picture , the page C has a high pagerank with a single backlink. The page E has a lot of backlinks but with small pageranks. There are 2 type of links: DoFollow and NoFollow links. The NoFollow links have no value in the eyes of search engines, only the DoFollow ones are counted as backlinks. 1. You can buy the backlinksThere are many backlinks building services, they create backlinks for a fee. This is one of the fastest ways but this isn`t free. 2. Comment on other blogsYou can build backlinks by commenting on other blogs. Most blogs have a Name/URL option, put some relevant keywords as name and the adress of your blog as URL or simply leave your link in the text of the comment. Don`t spam , comment something whats relevant to the given post. You can use the Free Fast Blog Finder tool to find high PR blogs. Most of the forums are allowing signatures , leave your link in your signature. Be active on forums cause every post is a new backlink. Submit your blog to blog directories like DMOZ or Yahoo Directory. You can select from free or payd directories , the result can be the sam at both , but at the paid directories you will be listed more faster. Site com conteúdo muito instrutivo eu estarei recomendando.